This is the first of a new series I want to start here on my blog.... called "Friday Five". Every Friday (hopefully) I will do a post of 5 things covering a range of topics. They could be 5 tips, 5 favorites, 5 beauty items, 5 uses, 5 reasons, etc. on anything you guys would like to read about! 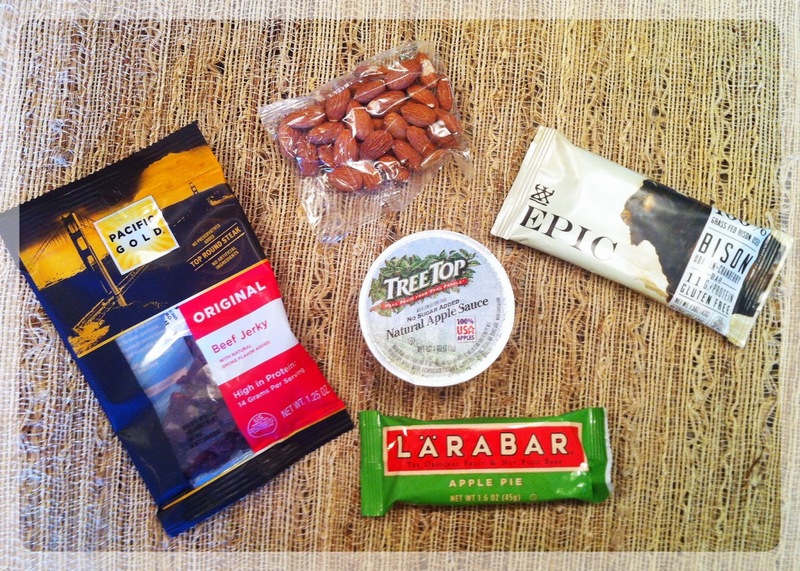 Today I wanted to share five Paleo-friendly snacks that are quick, easy, and great for on-the-go since they are pre-packaged and ready to eat. Here they are! Beef Jerky: Single-serving sized bags of jerky are a great source of protein for on-the-go. Look for brands that are gluten free and contain minimal sugar, like this Pacific Gold brand (found at Costco). The fewer ingredients, the better! Almonds: I find these small "handful" bags of almonds at Trader Joe's. I love how it gives you a controlled size so that you can get the energy and nutrients you need, without overdoing it as far as calories go. Larabars: My favorite fruit and nut bar, that also makes a tasty dessert! I love how minimal the ingredients are, while still packing a major flavor punch. Click here for my homemade version of the Coconut Cream Pie flavor. Epic Bars: Lots of people love these bars, and I can see why! These are the ultimate Paleo-friendly protein bars. The protein source is quality, grass-fed meat, and the carbs come from dried fruits. They make for a great complete snack for on-the-go! 5 great appetizers to take to a party?